Rudolf the Red Nosed Reindeer … well, as least his cute little feet that is! The holidays are so much fun, especially when the 5 Days of Christmas Ornaments are here! This years series is a lot of fun and all about … feet! 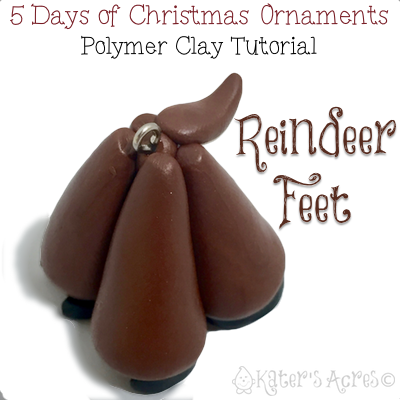 Today we bring you another cute ornament with Reindeer Feet. I love Christmas and I really love making Christmas ornaments. I hope that this year’s batch of Christmas ornaments will be inspiring and you will make your own from them as well. Don’t forget to share the tutorial link with others you know that might like it. Cut 4, 3/4″ rounds from black clay. Cut a little “notch” out of each round. Place them as shown on your work surface. Cut 4, 1″ rounds from brown polymer clay. Roll each round into a ball. Bend the teardrops together until they touch with the bottoms still flush on your work surface. Make a tiny little tail and attach it to the legs. Attach a tiny little screw into the middle of the legs to make the ornament “hangable” later.